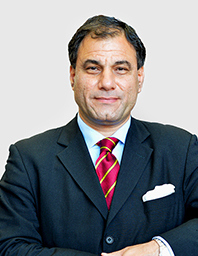 Lord Karan Bilimoria CBE, DL is the founder and Chairman of Cobra Beer Partnership Limited and of Molson Coors Cobra India. He is the Founding Chairman of the UK India Business Council, a Deputy Lieutenant of Greater London, a former Chancellor of Thames Valley University (now the University of West London); he was the youngest University Chancellor in the UK when appointed. In 2014, he was appointed as the 7th Chancellor of the University of Birmingham and was the first Indian born Chancellor of a Russell Group University in Great Britain. Karan was Senior Non-Executive Director of the Booker Group PLC, the FTSE 250 Company of Booker Prize fame from 2007 – 2016; he is one of the first two visiting entrepreneurs at the University of Cambridge; he is a founding member of the Prime Minister of India’s Global Advisory Council. In 2006, Karan Bilimoria was appointed the Lord Bilimoria of Chelsea, making him the first ever Zoroastrian Parsi to sit in the House of Lords. In 2008 he was awarded the Pravasi Bhartiya Samman by the President of India. He is an honorary fellow of Sidney Sussex College Cambridge and Chairman of the Advisory Board of the Judge Business School, Cambridge University. He qualified as a Chartered Accountant with Ernst & Young and graduated in law from the University of Cambridge. He is also an alumnus of the Cranfield School of Management, the London Business School and the Harvard Business School. In 2015, Karan Bilimoria was appointed President of the UK Council for International Student Affairs (UKCISA).